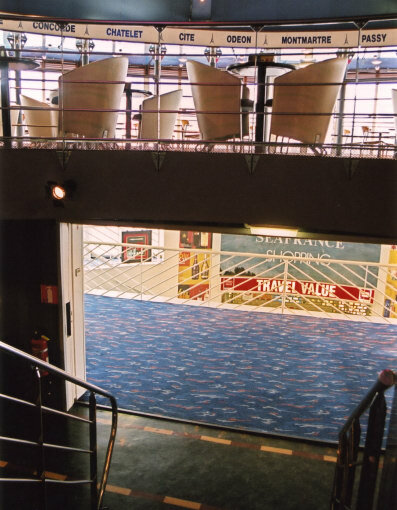 Above: A picture demonstrating the spatial relationship between the Parisien Café on Deck 5, the upper lobby on Deck 4 and the entrance to the Shopping Centre off the staircase linking the latter with Deck 3. Above & below: The aft end of the outside deck space (above), showing the small area of deck found on the lower level outside what became Le Pub from January 1996. 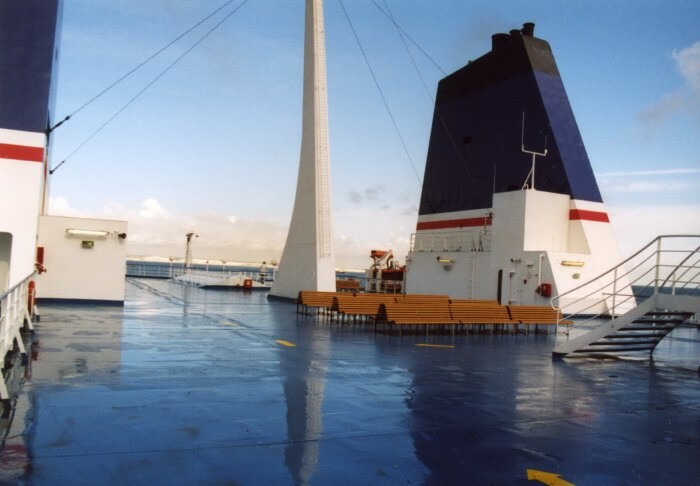 This is where the foot passenger gangway rests when the ship is berthed in Dover. 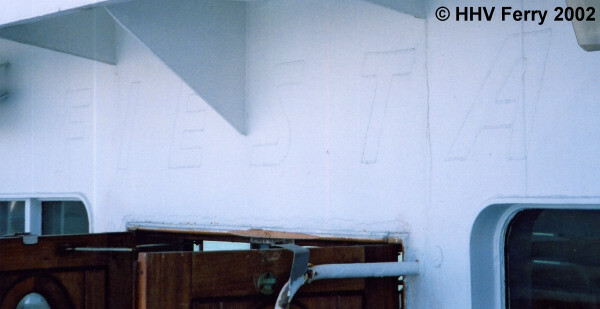 As passengers enter the bar itself, they pass beneath the ship's former name - painted over but still very visible (below). 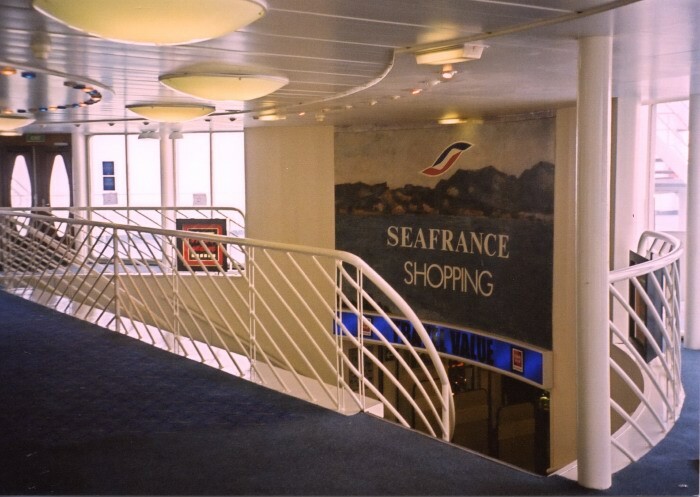 Above: The upper lobby in Seafrance days (2001), looking down to the Shopping Centre entrance. 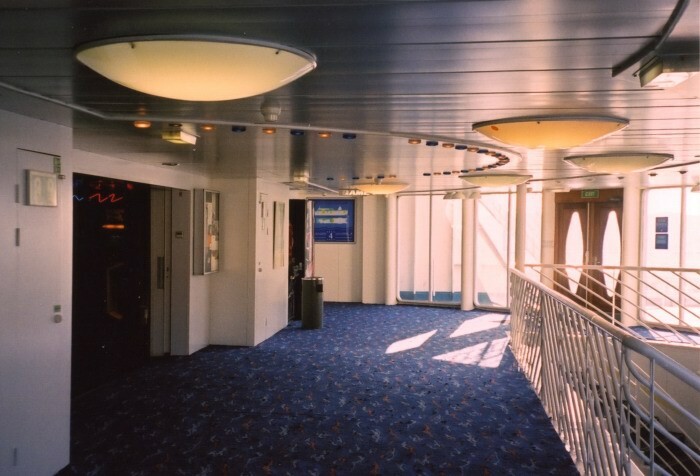 Above: The upper lobby as it looked after the relatively substantial winter 2002/2003 refit whenmost of the ship was re-carpeted - in this case a patriotic red, white and blue affair has superseded the previous Stena-like carpet. The old Rock Box logo on the ceiling outside what is now the Video Games arcade and entrance to the Parisien Café has long since been removed although the associated semicircle of flashing lights remain. The larger light fixtures are the standard Platner saucers. Above: Hidden away in a corner of the upper lobby are the pair of original telephone booths. 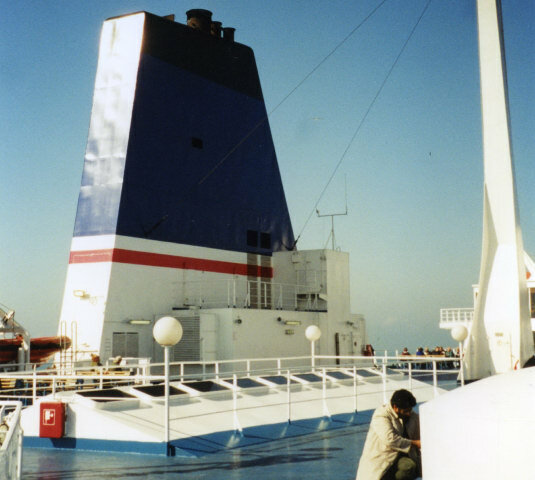 These are seen on the Seafrance Cézanne in 2003 by which time they had been taken out of use. 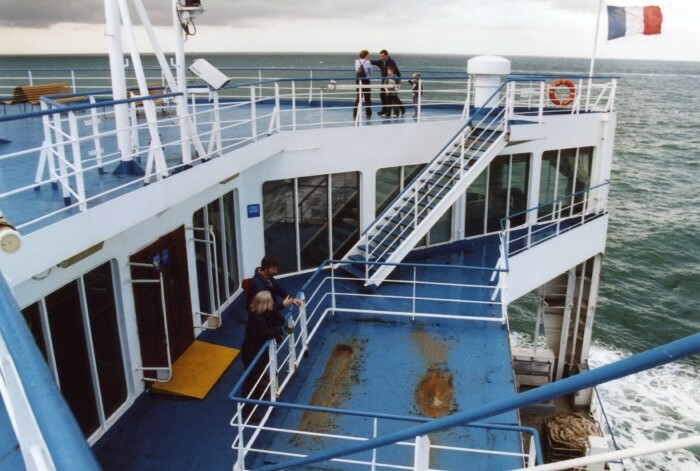 Above: An overall view of the main outside deck space on the Seafrance Cézanne in 2004. Above: Looking forward to the dome and the Parisien Café in July 2002. 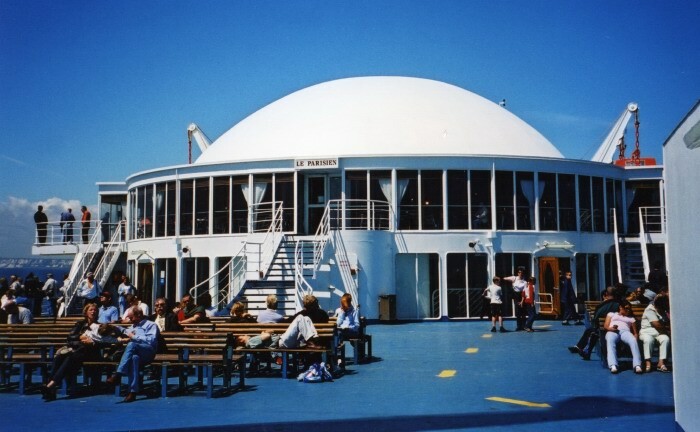 Above: A view showing the port-side funnel and the skylight for Le Pub with the huge free-standing mainmast towering above on the right. 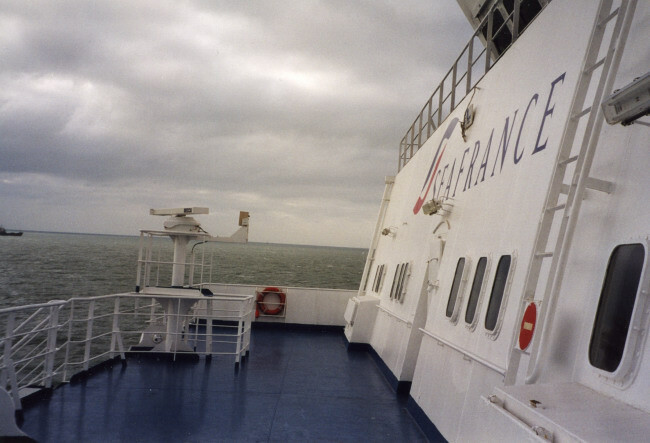 Above: Looking directly forward along the ship's centreline towards the dome on the Seafrance Cézanne. 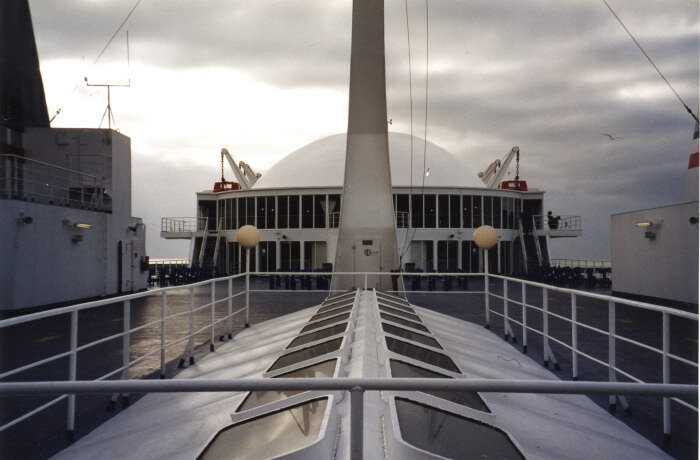 Above & below: The other main area of outside deck (particularly after the narrow open side promenades were closed off to passenger use in the mid-1990s) was forward of the Globetrotter/Motorists' Haven/Brasserie Lounge where space was available on two levels offering views over the bow (below). The upper level is pictured (above) although this became permanently roped-off from about 2003 onwards. 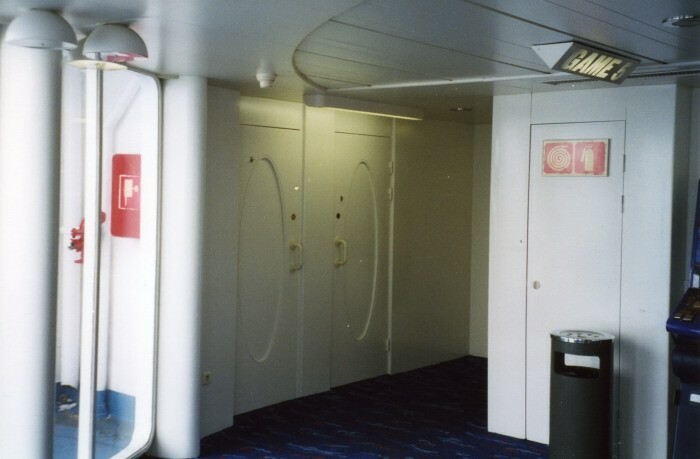 Access to the lower level was itself often difficult, being gained from the often-closed upper deck of the two-tier forward lounge. Above: By 2006, the upper level of the Brasserie lounge appeared to be almost permanently closed off, and in use as a crew area. 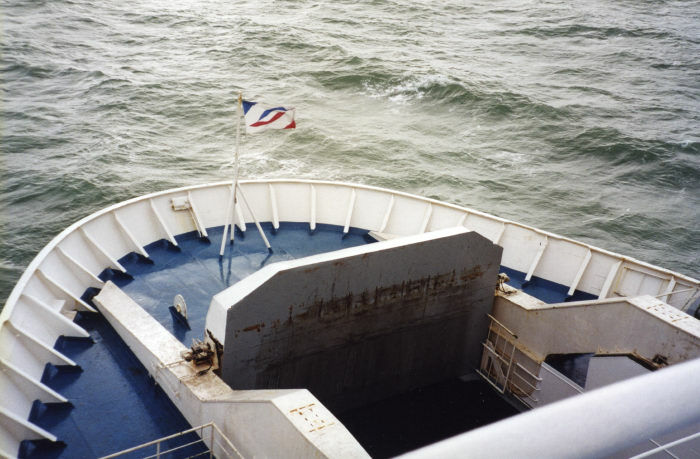 During one crossing in September of that year, in one corner could be found an overflowing trash can, full of cigarette stubs and ash; the crew members who used this area during their breaks (the ship is now non-smoking for passengers) had on occasion missed altogether and ash could be seen ground into the carpet and sofa seating. As a whole, the Seafrance Cézanne was gaining an unfortunate but deserved reputation for poor maintenance. 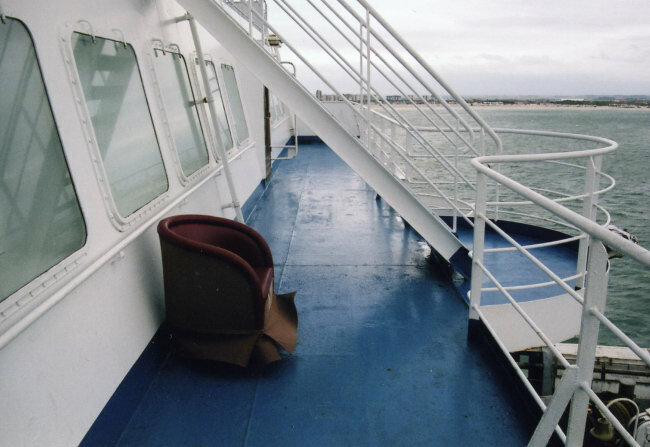 Looking out onto the forward outside deck, one of the Brasserie's tub chairs could be found in a distinctly weatherbeaten condition. It seemed to have been there for some time.